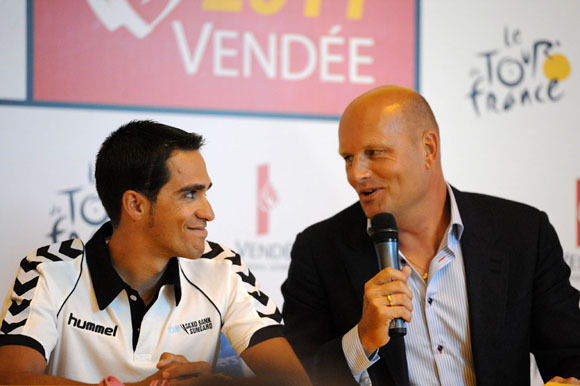 Saxo Bank manager Bjarne Riis and team leader Alberto Contador gave a less-than-convincing performance at their pre-Tour press conference. The answers were never going to be satisfactory. But what was made clear during Thursday afternoon’s press conference is that Bjarne Riis, Alberto Contador and his Saxo Bank sponsors have decided to brazen it out. The disconnected dots of the sport’s anti-doping legislation and procedure has enabled them to do so, of course, but for Riis to take his opening Tour de France press conference as an opportunity to deliver a sermon on the importance of adhering to rules was stretching things too far. When it was all over, it was as if the elephant in the room had left behind a steaming and pungent pile of hypocrisy. In his opening address at the press centre in Les Herbiers, Riis meandered to his point. There were no questions from the floor until he had introduced his nine riders, all of whom were in great shape and eager to get on with the race, we were assured. Then Riis passed comment on the parcours (which he said was exciting), the prospects of a great race (which he was sure would also be exciting) and the potential rivalry between Contador and Andy Schleck (you’ve guessed it, exciting). Finally, and pre-empting the inevitable questions, he adopted a more solemn tone. “I am sure there are going to be a lot of questions about Alberto riding the Tour de France. We have had questions all year but the answer is the same as always. “Everyone would have loved to have had a solution a while ago, before the Tour, but that hasn’t happened. Unfortunately, that’s the way it is. They are the rules. We have to respect the system as it is. Alberto was cleared by the cycling system and he has all his rights. As long as he is cleared we will continue to support Alberto and that is why he is continuing to ride in this Tour de France. “I don’t see why he should be punished or suspended from racing when he’s cleared. The simple reason is we don’t think it’s fair. Ah yes. The rules. Contador, for those who are catching up with the situation, tested positive for a banned drug, clenbuterol, during last year’s Tour de France. The Spanish Cycling Federation banned him for a year, even though the rules dictate that he should have been handed the mandatory two-year ban for a first offence. In February, the Spanish Cycling Federation reversed its decision and cleared Contador but without making its reasons public. This prompted the UCI and WADA [World Anti-Doping Agency] to appeal to the Court of Arbitration for Sport [CAS]. Contador was now free to compete and in May he won the Giro d’Italia. It was also announced that the CAS hearing, initially slated to for late June, would be delayed until August, clearing Contador to take part in the Tour. However, there is the possibility that he could win this Tour and then be stripped of both the 2010 and 2011 titles if CAS rules against him in August. It is an ugly scenario and one that robs the pre-Tour anticipation of some of its excitement. Not for Riis, of course. He’s excited enough. 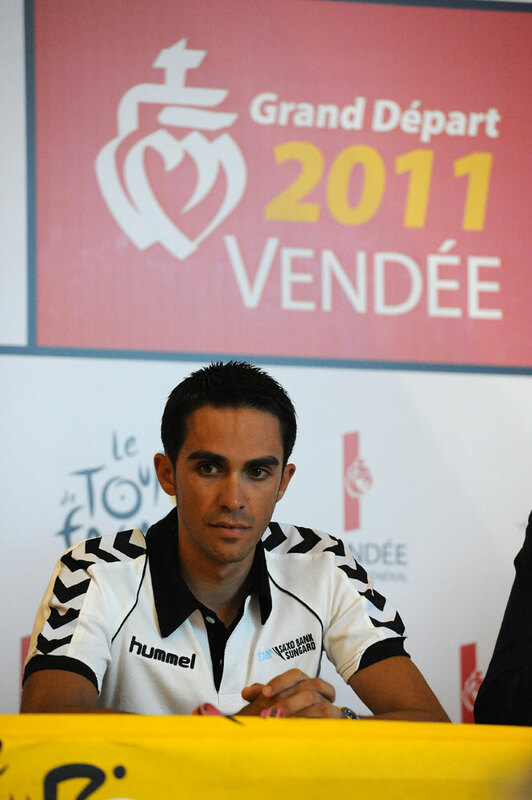 Alberto Contador turned professional in 2003 with the ONCE team, which was run by Manolo Saiz. When ONCE’s sponsorship ended, the Liberty Seguros insurance company stepped in. Liberty Seguros pulled the plug in 2006 when Saiz was arrested by Spanish police investigating the activities of a gynaecologist called Dr Eufemiano Fuentes, who ran a blood-doping business. Dozens of riders were implicated. Jan Ullrich and Ivan Basso were forced to pull out of the Tour de France before it started when they were outed as clients of Fuentes. Fuentes gave all his clients nicknames and it was alleged that the initials AC in his documents referred to Alberto Contador, although this was denied by the rider and was never proved. Contador’s saviour was Johan Bruyneel and the Discovery Channel team. The Spaniard won the 2007 Tour de France after Michael Rasmussen was sent home in disgrace while leading the race when it was revealed he’d lied about his whereabouts to anti-doping officials, possibly to evade out-of-competition dope tests. Bruyneel’s legacy is currently being scrutinised. The Belgian ran the US Postal Service team and then Discovery Channel but for the past year or so federal investigators have been probing allegations that riders on those teams were doped following allegations by Floyd Landis and, more recently, Tyler Hamilton. 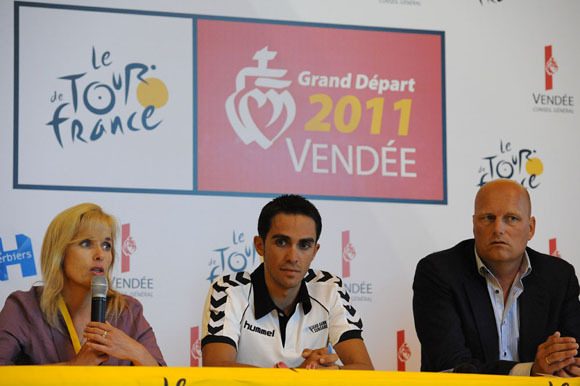 In 2008, Contador went from the frying pan to the fire. Discovery Channel pulled out of cycling and Bruyneel’s saviour was Astana. This was six months after Alexandre Vinokourov and Andrey Kaschechkin had both tested positive for banned blood transfusions. Vinokourov was kicked out of the Tour de France the same week as Rasmussen. Because Astana had disgraced the Tour in 2007, ASO declined to invite them to the 2008 race. Contador took that as a minor irritation and won both the Giro and the Vuelta. In 2009 Contador won his second Tour and last year he added his third. During the Tour, Riis and Contador negotiated a deal which would take the rider to Saxo Bank as a direct replacement for Andy Schleck, who was leaving. And then came news of the positive dope test. But Riis stood by his man. So, in his career as a spotlessly clean athlete, Contador has ridden for teams mired in doping allegations or run by dopers. His managers have been Saiz, Bruyneel, Giuseppe Martinelli (who was Marco Pantani’s manager at Carrera and Mercatone Uno during the time when the Italian rider had a very high haematocrit level more than once), and now Riis. In the press conference, Paul Kimmage asked the first taxing question, and it was along the same lines. “Bjarne, you used the word ‘fair’ several times in your opening address and to give you credit, you didn’t even blush,” said the Sunday Times journalist and former professional cyclist. “I’d like to ask Alberto what I consider to be a fair question. Most of the rest of the questions were about the race and his rivalry with Andy Schleck. It would be easy to criticise the 200 or so journalists present in the press conference for not sticking to the important questions but it is also necessary to understand how things panned out. To ensure everyone can hear the questions and answers, a microphone is handed to a journalist selected to ask a question. For the Team Sky press conference that preceded Saxo Bank’s, the microphone was passed around by Christophe Marchadier, who works in the press relations department of ASO, the race organiser. However, for the Saxo Bank press conference, the microphone was passed around by Jacinto Vidarte, Contador’s press spokesman. And, while we could be mistaken about the significance of this, Vidarte appeared, on a number of occasions to take his cue from Anders Damsgaard, the Saxo Bank team’s press officer, who was sitting alongside Riis. Several journalists who had pertinent questions were not selected. Bonnie Ford of ESPN had her hand up and told me afterwards that she wanted to ask Alberto Contador whether he felt like he had been cleared, given the scrutiny he found himself under. All this serves to illustrate that toughing it out looks like being an effective strategy for Riis and Contador. The questions won’t stop and the answers will not change but in the meantime Contador is free to pursue the prize money and the glory. Riis will reap the rewards and so too will Saxo Bank. The lawyers will also collect their fees. Okay, it may not convince the hardened sceptics, but nothing will persuade them anyway. After the formal part of the press conference, Riis was surrounded by journalists. One asked him whether he was worried that the sport’s reputation continued to suffer because of the failure to conclude the Contador issue before the Tour. “I think everyone is worried about the sport’s reputation,” he said. While Riis stands by his man and cites his belief in sticking to the rules, it is worth remembering that he cheated to win the 1996 Tour de France by taking EPO. The rules were clear. Any substance to boost blood was banned. There was not a valid test to detect EPO at the time and so its abuse went unchecked, save for a UCI rule limiting a rider’s red blood cell count to 50 per cent. Riis was nicknamed, during the later years of his career, Mr 60 Per Cent. In 2007, he finally admitted doping and offered to hand back his yellow jersey. He fixed me with what I’m sure he thought was an intimidating and icy glare but did not answer. Instead he moved off to answer more palatable questions. The problem for the Tour de France is that instead of focusing on what is genuinely exciting we are lumbered with an impossible situation. To a casual observer it looks absurd. Last year’s winner failed a dope test, was cleared by his own national federation (a decision which is pending appeal) and yet he is here to defend his crown. Just how exciting is that, Mr Riis? Cycle Sport’s Tour Village: All of our Tour coverage.